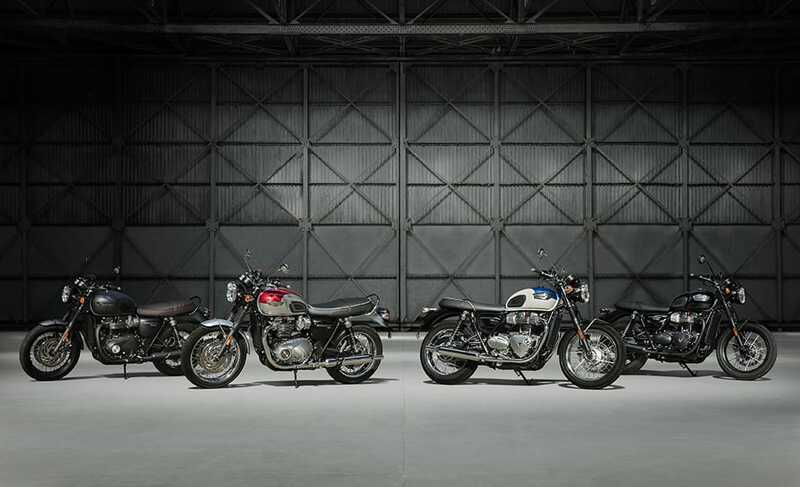 Triumph have added three additions the ‘Classic‘ range, the T100, T100 Black and the Cafe Racer styled Street Cup, all three being based on the High Torque 900cc liquid cooled 8 valve engine. The T100 and Black are priced at £8,300.00, with the Street Cup coming in £300 more at £8,600.00. 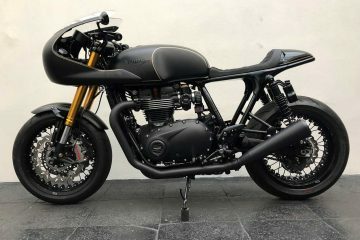 A point many will be happy with is that the T100 and T100 Black both sit on spoked wheels, a big styling improvement on the cast wheels fitted to the £7,350.00 Street Twin, something which a few of us didn’t like. 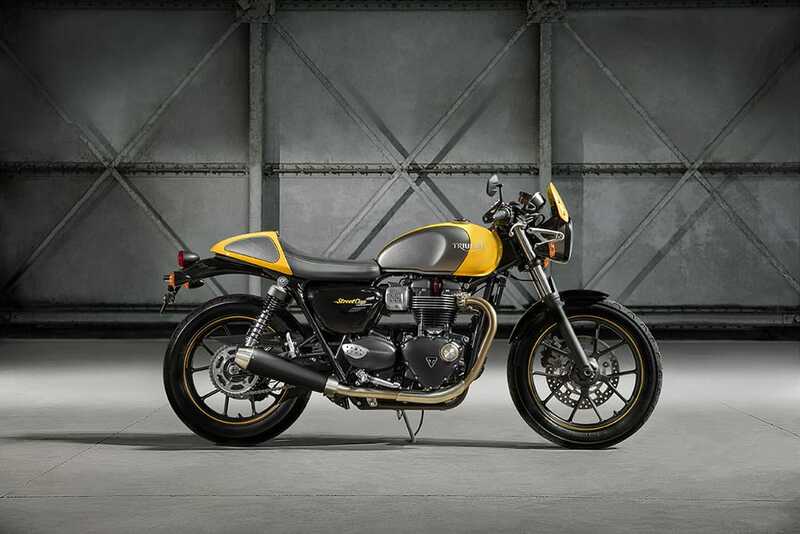 The Street Cup is a more moderately priced Cafe Racers styled Twin, selling £1800 less that the 1200cc Thruxton. 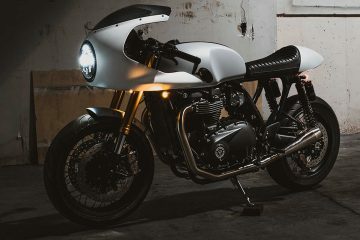 Unfortunately the Street Cup does have cast wheels, a bit of a shame but it features an attractive brushed stainless steel 2 > 2 exhaust system, drop bars, bullet seat, seat cowl, Fly-screen as well as foot pegs and forged headlight brackets from the Thruxton R – as well as the Thruxtons Twin clocks with polished stainless steel bezels. 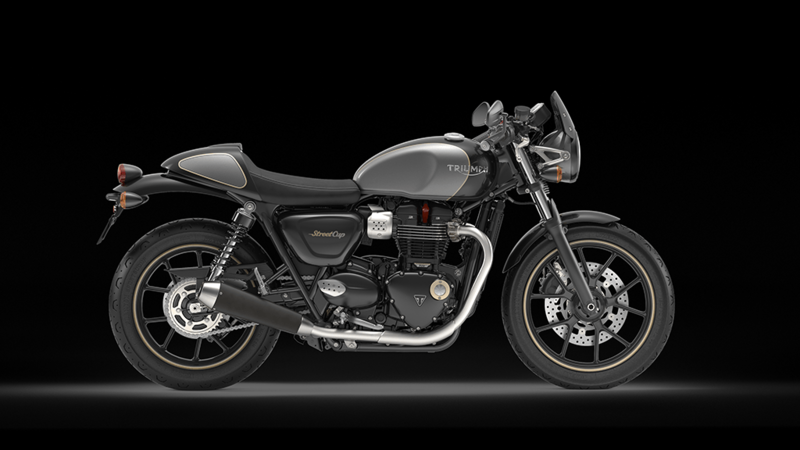 The exciting new entry point for the internationally acclaimed Bonneville family has arrived in the classically styled form of the T100 and T100 Black. 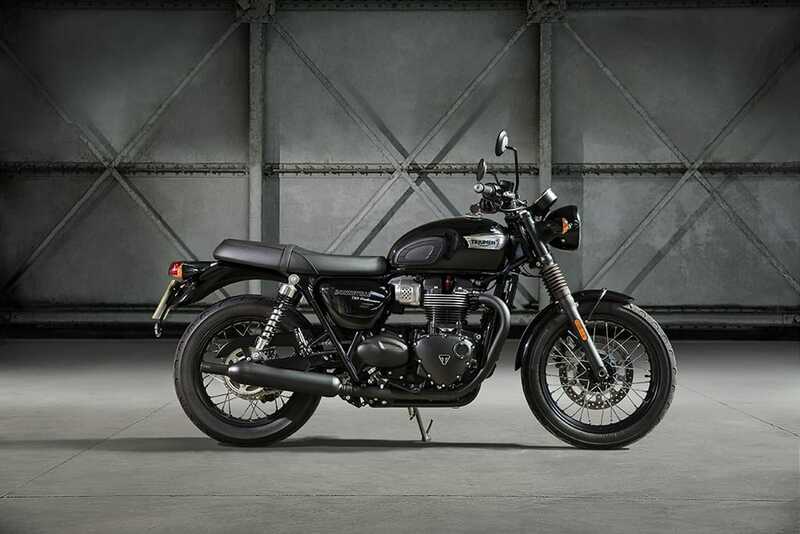 Now even more accessible and lighter than the T120, the all-new Bonneville T100 and T100 Black make owning an original icon easier than ever before. 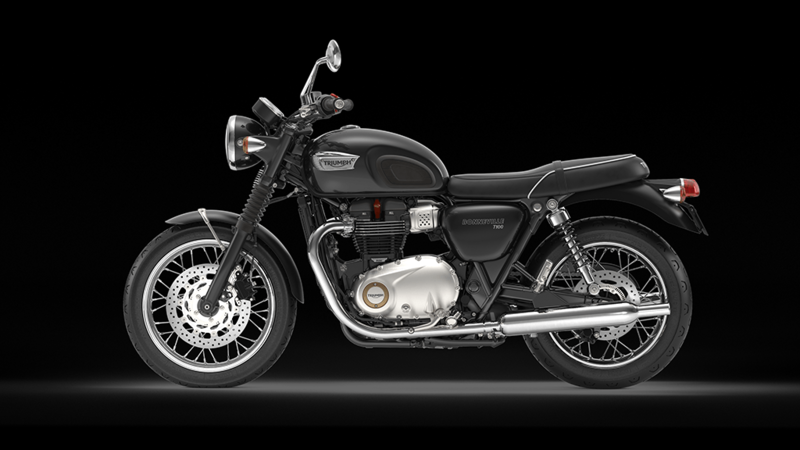 EUROPE ONLY: To make the new classic Bonneville T100 and T100 Black even more accessible, a dealer fitted A2 licence kit will be available for models supplied from late Spring onwards. Inspired by the legendary ’59 Bonneville, and styled to incorporate more of the iconic design, silhouette and character of the original, the T100 and T100 Black have all the timeless style and signature touches of a genuine motorcycle icon. Combining the highest standard of detail and finish with the quality, performance, capability and comfort of the next generation Bonnevilles. Powered by the critically acclaimed 900cc Bonneville engine with more torque, better fuel economy and a rich, deeper exhaust note. The T100 and T100 Black are the latest additions to the contemporary new Bonneville range, each one built to enhance the iconic Bonneville character and to satisfy today’s demand for bikes that combine timeless style with modern capabilities. The all-new 900cc powered T100 and T100 Black are lighter than the T120s, easy to manage and with over 150 accessories available, are ready to personalise. 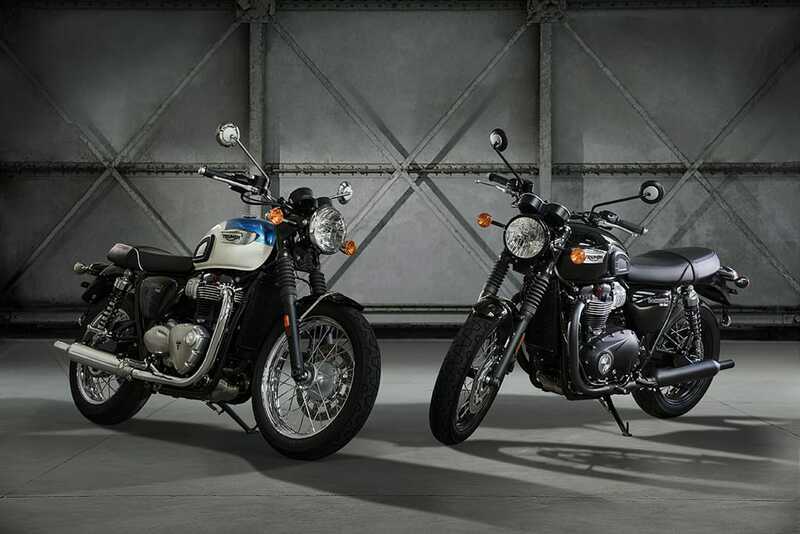 Sharing the distinctive Bonneville silhouette and many of the stunning features of the T120, the new T100 and T100 Black are both timeless icons, beautifully evolved. From the sculpted lines of the 14.5 litre signature fuel tank, to the intricately detailed Bonneville engine plate and stylish feature-packed twin clocks, the new T100’s set a new standard for quality and finish. 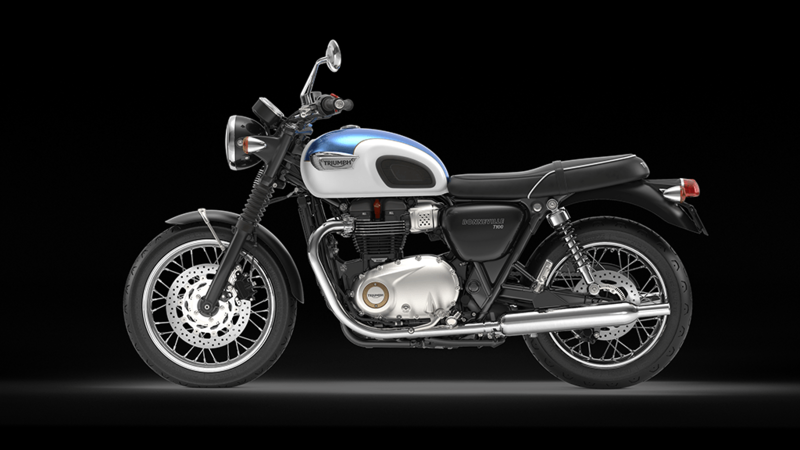 The Bonneville T100 features a wealth of classically inspired detailing and stunning chrome finishes including high-value brushed aluminium covers, classic bolt-on Triumph badges unique to these two models, and deep chrome mirrors, mudguard stays, handlebars and headlight bezel. Contributing to the classic Bonneville profile on the T100 is the detailed comfort seat and pillion seat finished in contrast piping with deeper foam for heightened comfort. Along with all the quality enhancements offered on the T100, the T100 Black boasts even more style and sophistication featuring fully black components including wheel rims, a twin skin peashooter exhaust in a matt black finish and blacked out engine covers for a truly unique look. From the extensive optional accessory range, cruise control and heated grips are available. 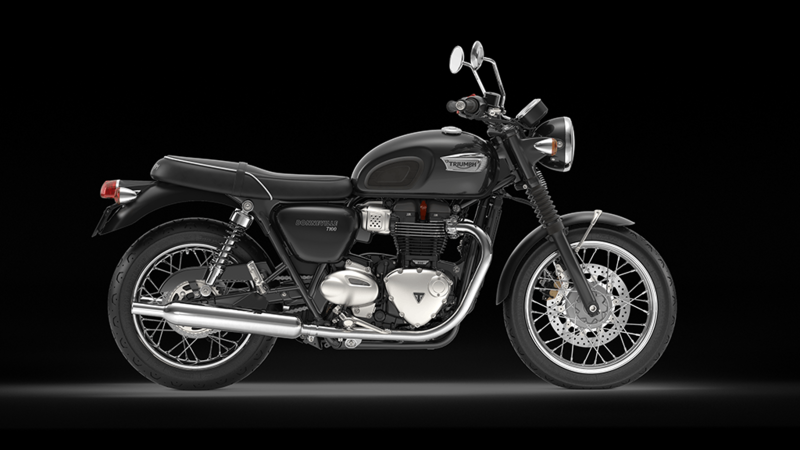 Offering all the quality, performance, capability and comfort expected of the modern Bonneville family, the T100 and T100 Black are powered by the critically acclaimed Bonneville 900cc, ‘high torque’ 8 valve, parallel twin engine that offers more torque, better fuel economy and a rich, deeper exhaust note. Specifically tuned to achieve much higher torque much lower down, it produces a peak torque figure of 80Nm at 3200 rpm – an increase of 18% on the outgoing Bonneville T100 for a more thrilling and engaging ride. With enhanced throttle response from Triumph’s ride-by-wire fuel injection and a slick new five-speed gearbox the T100 models are engineered to deliver a 270° firing interval for a smooth, linear power delivery. A cutting-edge liquid cooling system, carefully integrated into the distinctive character of the Bonneville, reduces fuel emissions and significantly improves fuel efficiency by up to 29%. This, combined with a new extended service interval of 10,000 miles (16,000km) dramatically reduces the overall cost of ownership. 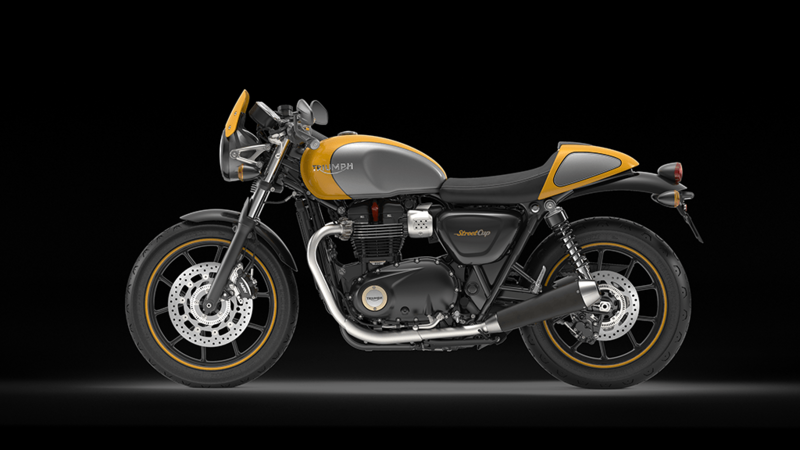 The T100s distinctive twin pea-shooter silencers are crafted in a classic style and come with the Bonneville’s ingenious twin skin design for a superb finish and clean line, delivering a unique rich exhaust note for the unmistakeable sound of a British Twin. A complete range of over 150 high quality accessories makes it easy for riders to really make their Bonneville T100 or T100 Black their own. For increased comfort and practicality, accessories include heated grips, a centre stand and grab rail and cruise control. For the long distance rider there is a stunning range of premium luggage options to choose from including tank bags and leather and leather canvas mix panniers. 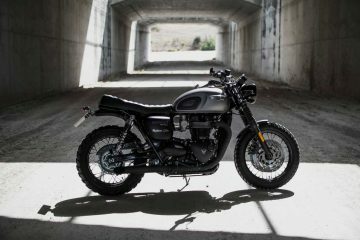 The contemporary urban sports Bonneville. New distinctive urban sports features, including an authentic bullet seat and removable ‘cafe racer’ seat cowl, racing inspired fly screen and bar end mirrors. Premium finishes, hand applied coach-lining and exciting 2-tone paint schemes. Dynamic sports focused ergonomics, engaged riding position and agile handling. Dedicated urban sports equipment, including dropped ‘Ace’ bars, unique RSUs, new Nissin twin piston sliding front caliper and floating disc. Unique chassis for a neutral and predictable ride with a low seat height and confidence inspiring “stand-over” – delivering a truly accessible bike for every type of rider. 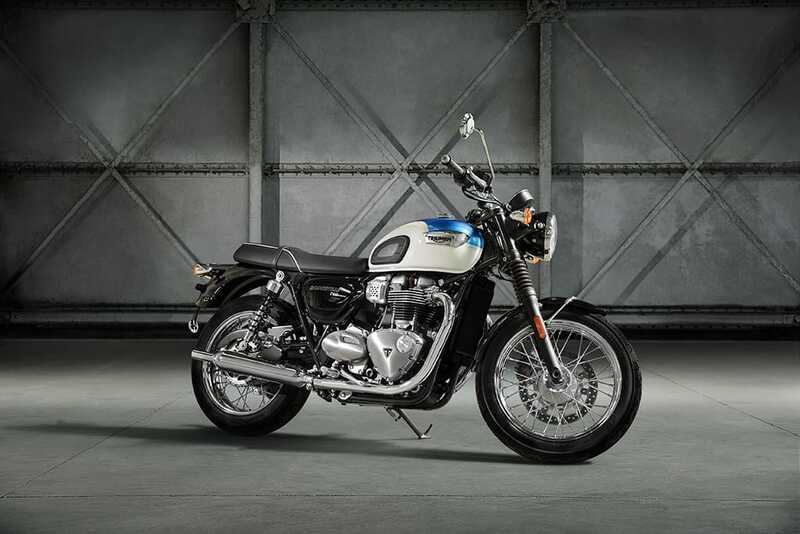 Critically acclaimed 900cc ‘High Torque’ Bonneville engine perfect for urban blasts and twisty B-road ride-outs. Dedicated shorter and lighter twin satin black and stainless steel upswept silencers, for a unique raw, rich and full soundtrack. Rider-focused technology for precision, control and safety, including ride-by-wire, switchable traction control, ABS and a torque assist clutch. 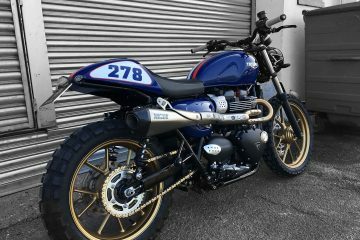 accessible addition to the Street Twin line up. up as the contemporary urban sports custom street racer. With a name inspired by the club racing scene, the Street Cup has been designed to deliver all the attitude, personality, presence and style of a contemporary custom cafe racer for today’s riders. covers with the Triumph makers mark triangle and Bonneville engine badge, elegant single throttle body with aluminium finisher and distinctive finned head and header clamps. Café racer inspired seat cowl, body colour painted with number board graphics. Easily removable to reveal pillion seat area. Colour matched fly-screen with matching graphic. Contemporary bar-end mirrors with forged arms. Twin clocks with polished stainless steel bezels, as featured on Thruxtons. To match its ‘street racer’ attitude the Street Cup has been developed to deliver more dynamic and sports focused ergonomics – without compromise to everyday comfort. Compared to the Street Twin the rider is seated slightly higher and further back and the handlebar position is lower and slightly further forwards. This delivers a more engaged riding position and also improves physical turn in. There are new distinctive dropped ‘Ace’ style bars and new, model specific rear suspension units that are longer (though still with the same 120mm rear wheel travel of the Street Twin), which raises the back end and steepens the head angle. Combined with the sporty riding position this enhances the bikes agility for direction changes. Taking the Street Cup to a new level of specification we have new high value 2-piston sliding axial Nissin caliper with machined branding and a floating brake disc. Just like the Street Twin, the new Street Cup chassis set-up is tuned to deliver a confidence inspiring and engaging ride. With the same evolution to “stand-over” ergonomics for feet flat on the floor manoeuvrability and low seat height, at 780mm, the Street Cup is a truly accessible and fun bike for every type of rider to get on and go. The critically acclaimed 900cc Bonneville engine from the Street Twin, makes the Street Cup the perfect companion for urban blasts and twisty B-road ride-outs. A major update to the original Bonneville engine platform, the 900cc engine features a charismatic 270° firing interval for smooth, linear power delivery from the slick five-speed gearbox. The engine is specifically tuned to deliver performance just where you need it, with an 18% increase in peak torque and up to 22% greater horse power in the mid-range than the previous generation engine, with peak torque figures of 80 Nm at 3200 rpm. Enhanced throttle response from Triumph’s ride-by-wire fuel injection and cutting-edge liquid cooling system, carefully integrated into the distinctive character of the Street Cup, reduces fuel emissions and significantly improves fuel efficiency by up to 36% on the previous generation. This, combined with a new extended service interval of 10,000 miles (16,000km) dramatically reduces the overall cost of ownership. The Street Cup’s all new distinctive shorter and lighter twin upswept silencers, with satin black painted wrap and stainless steel end cap deliver the unmistakable sound of a British Twin, with a unique exhaust note to match its classic sporting character – rich, deep and full. incorporating a digital menu system for fingertip control while riding. and heated grips are available. To make the Street Cup even more accessible, an A2 licence kit will be available for models supplied from late Spring onwards. The A2 kit can be easily fitted and just as easily removed by a Triumph dealer. Local market legislative requirements will apply. October 5, 2016 Hans Erik H.
I’m sure the ride is improved but like the new T120, these bikes have lost a lot of the classic Bonneville look. The previous T100 with a few basic styling mods could actually be mistaken for a vintage bike in many cases. The new generation looks exactly like a modern day attempt at a retro bike. A bit too polished and a little hokey looking. Why would you include the word “Black” in the side decal of the T100 Black – isn’t the colour obvious enough? Factory produced accessories take away from the originality of aftermarket customization. Yes people the engineering is better but these bikes have declined in the looks department. Bring on the inane bickering, deep down you all know I’m right. I think to a degree you are right Hans, but I don’t think they as bad as you portray them. Walking around the new T120, there was little i didn’t like. Riding a Thruxton, I can say that it not only performs like modern bike, but still has plenty of retro character – Im a fan of the new Twin, but, given the choice, I would always pick a Carb model Bonneville over everything else, this is down to the price, looks, they are basic and there are plenty of aftermarket goodies on the market for them..